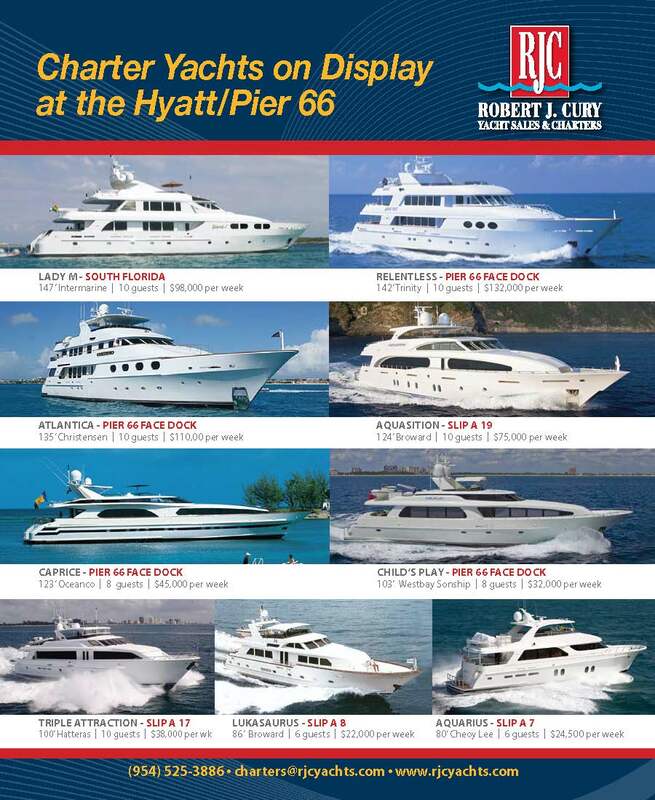 RJC Yacht Sales & Charter is pleased to be featuring Eight (8) Charter Yachts during the Fort Lauderdale International Boat show, and all on the same dock!! This entry was posted in Uncategorized and tagged Bob Cury, Brokerage, Broward, Broward Yachts, Charter Boat, charter brokers, Charter Yachts, Cheoy Lee, David Wiest, Fort Lauderdale, Ft. Lauderdale International Boat Show, Hatteras Motoryacht, Hatteras of Lauderdale, Hatteras Yachts, Hyatt Pier 66, Intermarine, Luxury Motor Yachts, M/Y Aquarius, M/Y ATLANTICA, M/Y CAPRICE, M/Y LADY M, M/Y LUKASAURIUS, M/Y RELENTLESS, Mark Osterhaven, MY Aquasition, MY Child's Play, MY Triple Attraction, Nicole Caulfield, pier 66, RJC Yachts, Robert J. Cury, Roscioli, yacht charter management, Yacht For Sale, Yacht Sales, Yachts For Sale. Bookmark the permalink.